The piA-AM3352 is a single board computer based on the ARM Cortex A8 architecture. It is enclosed in a top-hat rail housing with IP20. Its CAN transceiver is isolated. The single board computer’s performance combined with its power efficiency makes the piA-AM3352 a possible choice for mobile communication as well as stationary controller applications. It is based on the piA-AM355x-PM. Due to its size of 119,2 mm x 113,6 mm x 22,5 mm it is a possible solution when there is not enough space for a full-sized PC system. 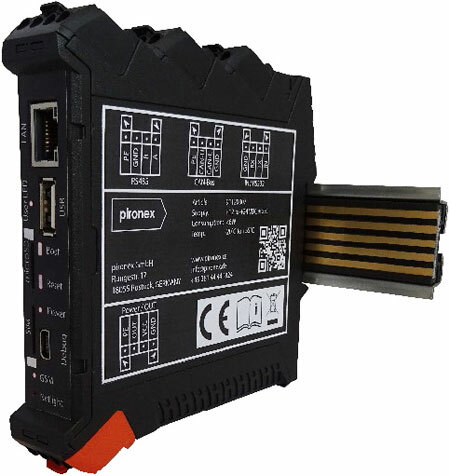 Possible applications are as a dynamic data logger, as a signal interface, for example for CAN, or as a master unit. In addition to Ethernet, EIA-485, and USB, the system allows the exchange of data via CAN and CANopen and wirelessly via GPRS/UMTS. The communication of multiple modules can be done via a CAN-based DIN rail (DIN rail bus CH20M), which replaces individual wiring by an uninterrupted and flexible system solution. The sustainability of the system is underlined by the use of Linux. Alternatively to this pre-configured Ångström based system, any Linux distribution that supports ARMv7 (e.g. Debian, Poky) can be used. For development of customized applications a cross compiler SDK is available. A performance upgrade is possible by exchanging the processor module.